Parts of Term (POT) are the designated dates within a full semester or term. Courses that begin/end in different parts of term may have different add/drop periods that could potentially affect tuition charges/refunds issued to students. For dates, please see the Academic Calendar. For example, Fall POT 5 begins in August. Web registration will available through the Aug. 7. After that time, Registration must be completed by the Office of the Registrar with the Registration Drop/Add Form or an approved staff member. Only applies to students utilizing the State Employee Tuition Fee Waiver or the Senior Citizen Tuition Fee Waiver. If you're registering for Parts of Term 5-9 or 90 (CE Summer PoT), registration can be completed beginning with the drop/add period for Part of Term 1. See the Academic Calendar for Part of Term 1 dates. POT 5-9 are used for varying dates that do not fit into other Parts of Term. 5= course starts during first month of term (can end at any time and may vary in length). Where can students see what POT a course is offered in? 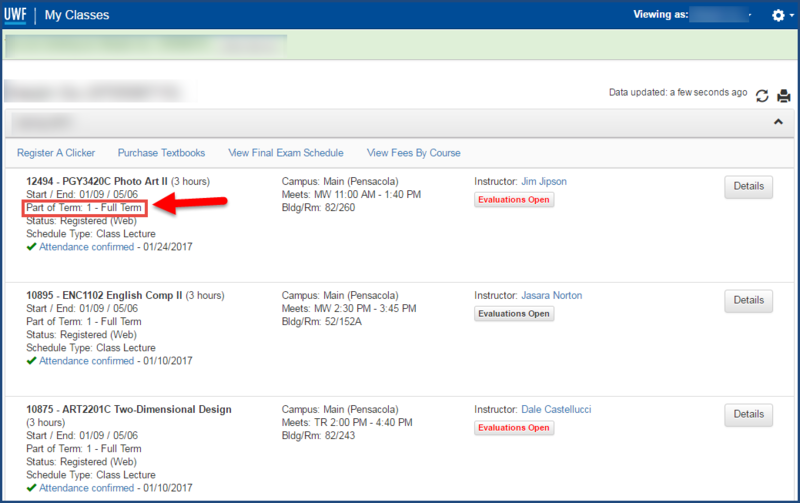 Students can see their Part of Term in their My Classes app in MyUWF. Where can instructors see what POT their course is offered in? Instructors can view their Part of Term in the Classmate app in MyUWF.